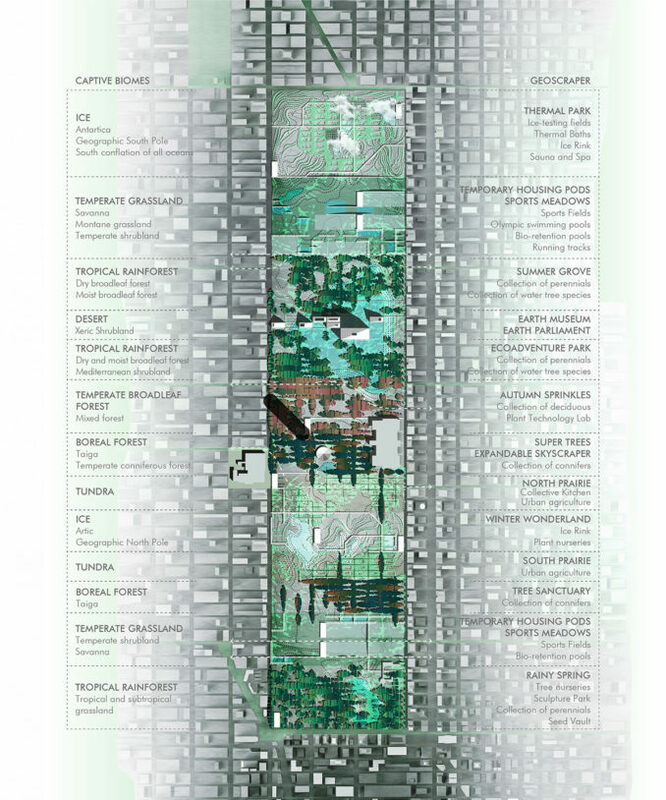 “From megastructures to new ecologies and radical ideas for democratizing public space, the LA+ ICONOCLAST winning entries show how designers can move beyond the status quo of picturesque large parks and embrace the challenges and opportunities of the 21st century,” jury chair Richard Weller said. 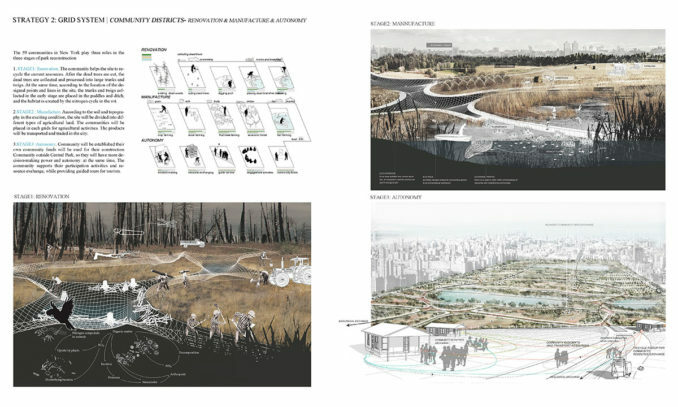 Each of the winners will receive $4,000 and the winning designs will be published in LA+ Journal, the interdisciplinary review of landscape architecture from the University of Pennsylvania School of Design. The jury further awarded 10 honorable mentions, which will also be published in the Fall 2019 issue of LA+ Journal. The issue will also feature juror interviews, essays, and a selection of notable entries making up a compelling and diverse salon des refuses. LA+ ICONOCLAST’s jury was comprised of Lola Sheppard (Partner, Lateral Office), Charles Waldheim (Professor and Director of the Office of Urbanism, Harvard GSD), Jenny Osuldsen (Partner and Director, Snøhetta), Geoff Manaugh (Author, BLDGBLOG), Beatrice Galilee (Associate Curator of Architecture + Design, The Metropolitan Museum of Art), and Richard Weller (Meyerson Chair of Urbanism and Professor and Chair of Landscape Architecture, PennDesign). 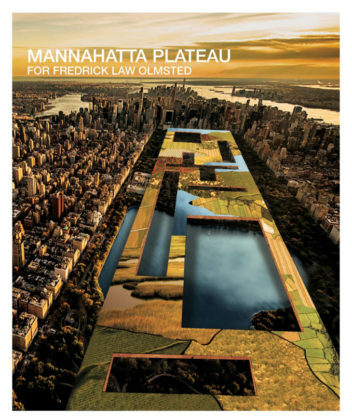 The Mannahatta Plateau is a megastructure supporting a second park above the original Central Park, designed to showcase the pre-colonization landscape of the New York region. The Geoscraper of the Captive Biomes is a new park themed around a collection of the world’s main bioregions and encompassing a greater diversity of social functions. 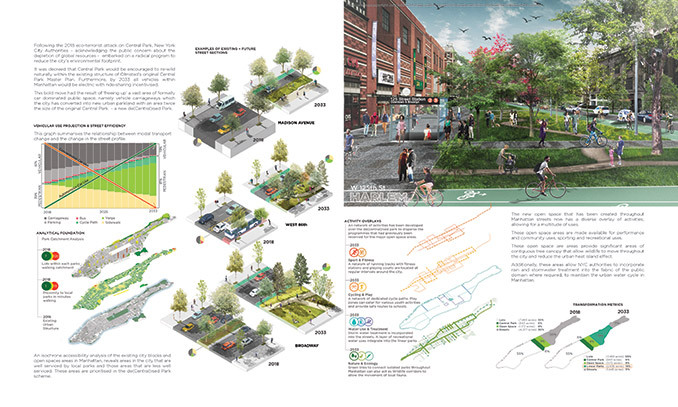 The De-Centralized Park concept proposes to let the park rewild itself over time but to also extend the park into all its connected streets. These new green streets are made possible by future decreased car usage due to a driverless fleet servicing Manhattan. 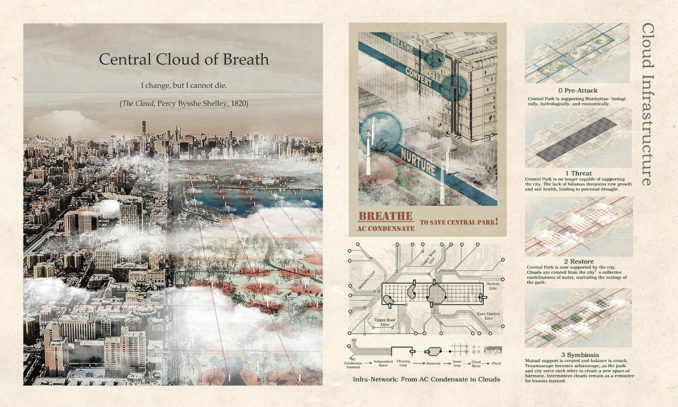 The Central Cloud creates a layer of mist that hovers over the park via an infrastructure that taps into Manhattan’s air conditioning condensate, with the aim of compensating for water loss during reconstruction of the park’s ecosystem following the fictional eco-terrorist attack posited by LA+ ICONOCLAST. This anti-gentrification concept takes Olmsted’s original idea of a democratic public space literally and parcels the park up into 59 sections, one for each community of New York. The idea is that communities can exploit their plots and have access to funds raised through their Central Park activities that will allow them to improve green spaces in their own communities.